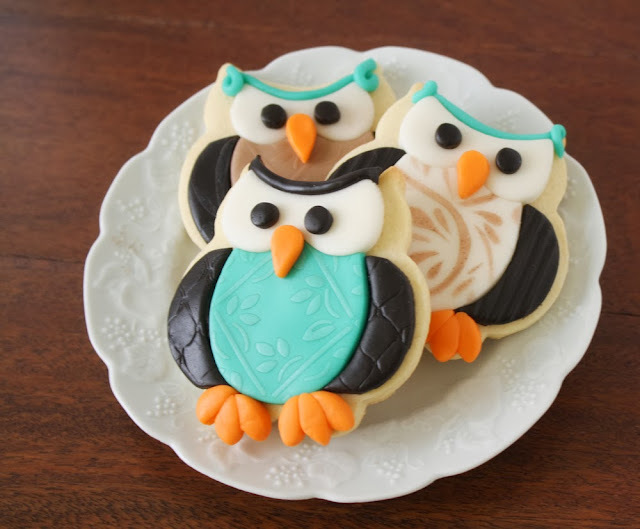 There is just something about owl cookies that make me happy. And for some reason every time I think of making owls I think they should be textured and patterned to the nines. I've made patterned owl cookies before using royal icing and a lot of piping but this time around I dressed them up with textured fondant. I am certainly no expert in working with fondant but it's fairly easy when you only have to cover a cookie. 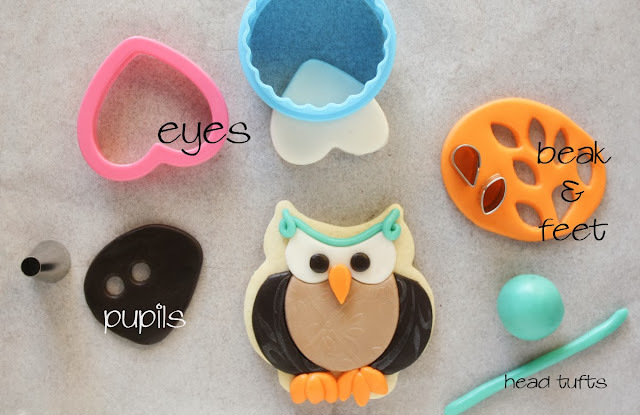 an owl cookie cutter. I used my own chubby owl cutter that I designed and it's for sale in my Etsy store. You can use just about anything to texture fondant. So much so that avoiding impressions in the fondant is usually the hard part of working with it. The plastic mat pictured is just some random vinyl I happened to have but it creates nice lines. Anything that has a texture will work so get creative! Be sure to run it through the dishwasher and it will be fine for incidental food contact. Obviously, fondant texture plates are made for this but you can also use stencils to give a light texture to fondant. 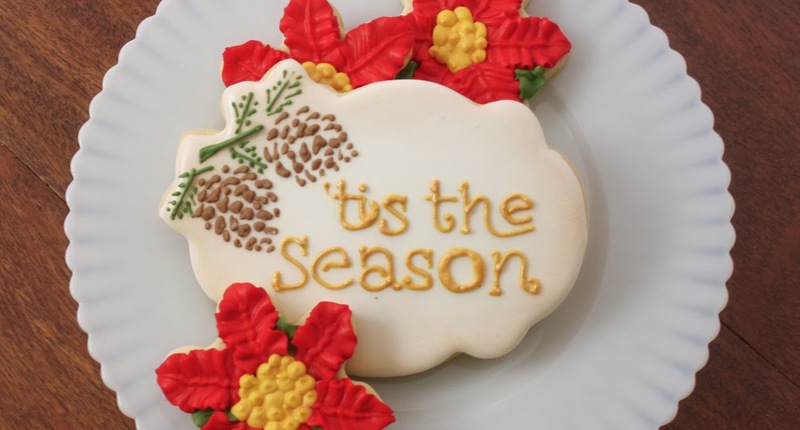 Stencils are a hot item in the cookie world right now and there are so many amazing designs to choose from. 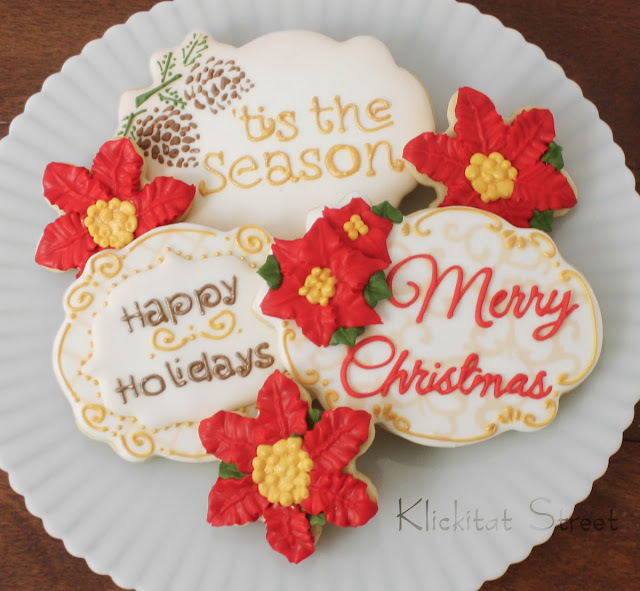 Try Salsa Sweets, The Cookie Countess or Artfully Designed for some fabulous finds! 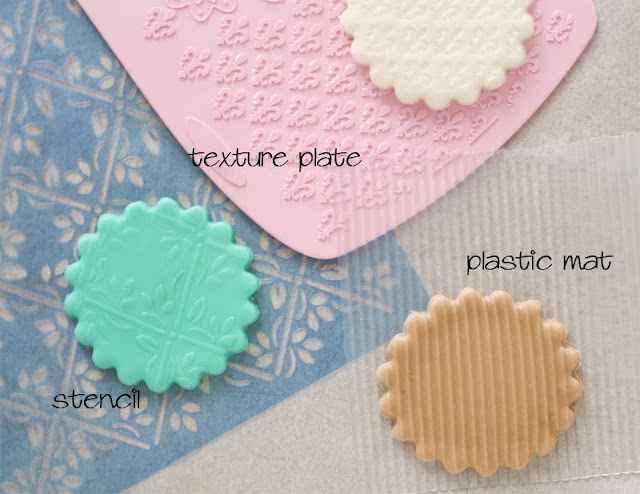 It is super easy to use stencils to texture fondant. Especially when you only need to work with small pieces for cookies. Start by rolling out the fondant a little thicker than you want it to be on the cookie. Lay your clean stencil on the fondant and gently roll the stencil into the fondant with a small rolling pin. You don't want to go too fast or use too much pressure because the stencil might lift up and could get damaged. If you like you can add extra color, sparkle or dimension by dusting the fondant with petal dust and a brush. Since the stencil is secured to the fondant only the cut outs will be colored. Gently peel the stencil away and the fondant will have a light texture. You can really see the effect of a light shimmer dust on the dark fondant. This is a really easy technique but it looks so good! 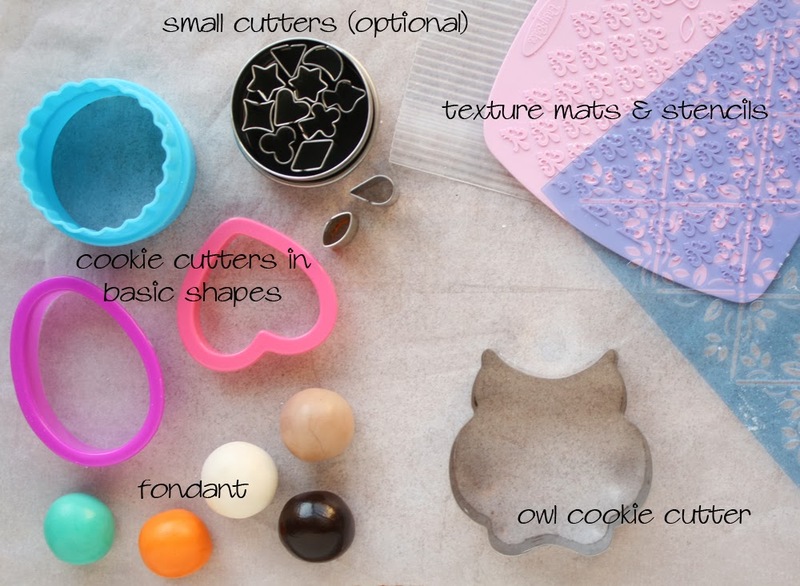 After you texture the fondant you are ready to decorate the owl. Cut the belly shape with a small egg or circle cookie cutter and cut a place for the eyes with a heart. 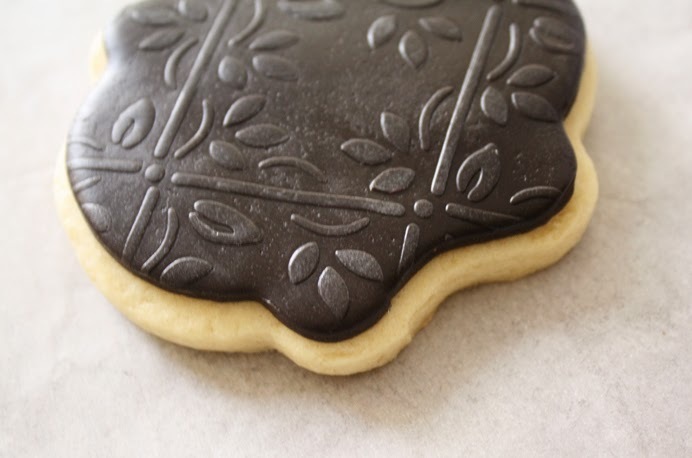 Gently remove the excess fondant and "glue" the belly to the cookie with simple syrup. Be sure to save the wings for a different cookie. Repeat these steps with a contrasting color of fondant to make the wings and attach them to the cookie as well. 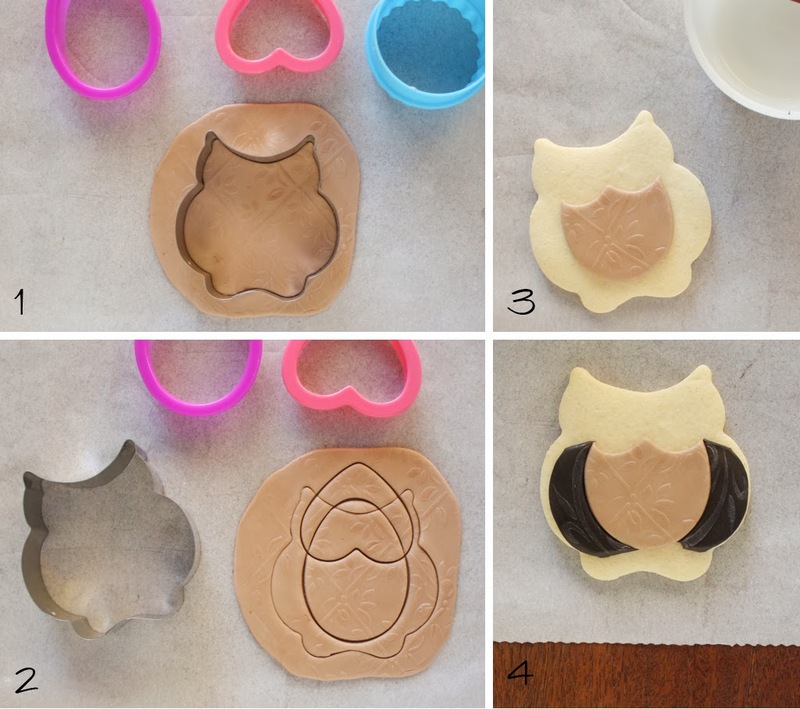 To finish up the owls cut eyes from white fondant using the small heart cutter and trim them with a circle. Cut pupils for the eyes from dark fondant with a decorating tip. Roll a short fondant rope and attach to the top of the head for the tufted "horn" feathers. I used these teeny-tiny cutters to make the feet and beak but if you don't have them you could just cut little "sausage" shapes from an orange fondant rope instead. That's all there is too it. I love seeing these little guys all line up like this and I hope you enjoy them too! Today I have my latest cookie cutter designs to share with you in my Etsy shop! Last year I wrote a post lamenting how I didn't own any pretty plaque cutters so this year I made myself a couple and I made a lot for you! My first plaque cutter is this flower plaque! I like the idea of adding embellishments to plaque cookies but sometimes piecing shapes together gets tedious especially if you are trying to combine multiple shapes. So I designed this cutter with little flowers already attached. 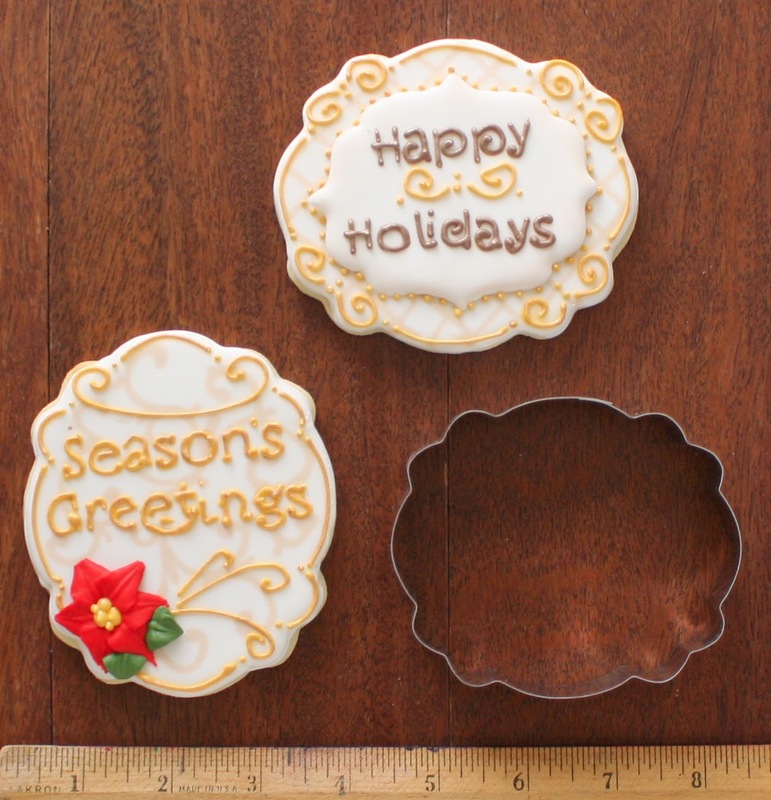 At 5 inches wide this large plaque is perfect for making a bold statement in a cookie platter. Of course the flower area isn't limited to flowers. It would work just as well with snowflakes, leaves, bows or other shapes like these pine boughs. 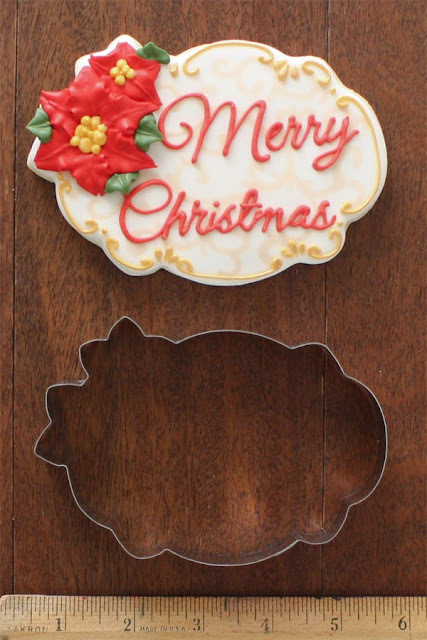 If you don't want every cookie to have flowers then it is super easy to use this cutter as a more general plaque. After cutting the shape simply rotate the cutter and line it up to cut the flowers off cleanly. Next is a slightly smaller plaque cutter. This plaque is a little narrower than the first, but they are both the same height so they go well together. I wanted this plaque to be a little whimsical but also sophisticated. I've name this the "Anna" plaque because I have to call it something but I also think it looks like a doll head! Those bumps are just right for some small bows! 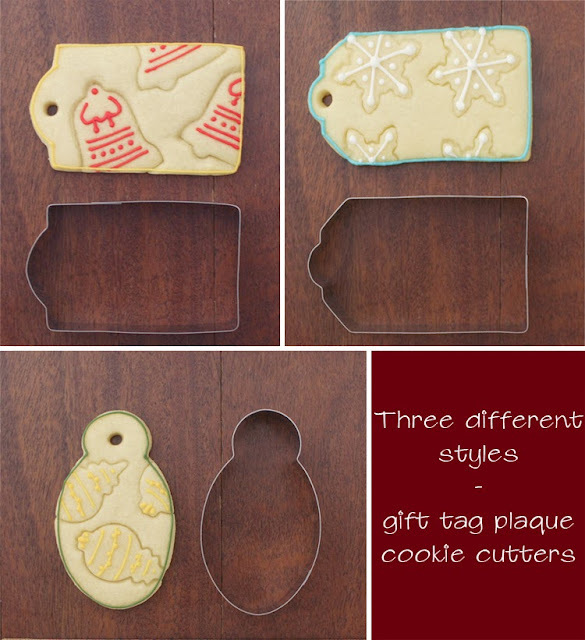 I've also added some large gift tag cookie cutters to the shop. These cutters are "full size" gift tags at 4 inches tall but can also be rotated and trimmed to make smaller tags as well. I want to give a huge thank you to everyone who supported my last set of gnome cookie cutters! I love seeing what you are making with them. You are always invited to share with me by posting on my Facebook wall!